2017 was a banner year for Strange Music. In just twelve months, the Strange roster accounted for the release of nine amazing albums, including two collaborative efforts that brought them all together. 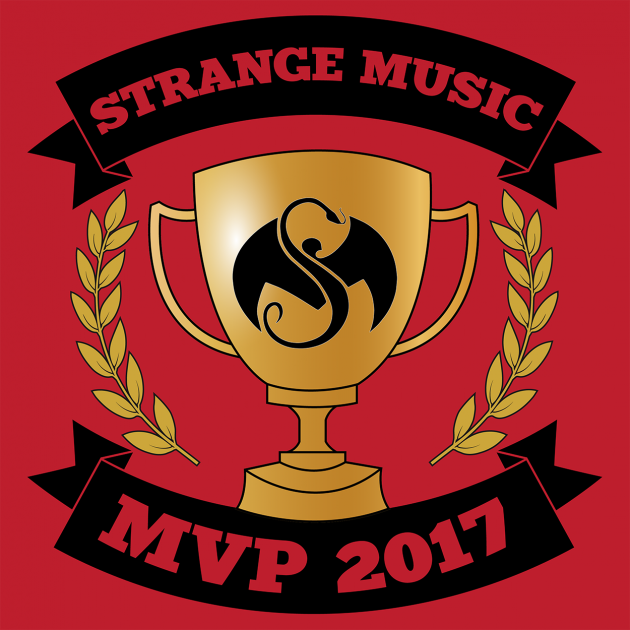 With so many great releases, it will be tough to choose the 2017 Strange Music MVP, but with great power comes great responsibility. It's your turn to vote for who took the crown this year. To help you out, we've summarized (some of) what each nominee has accomplished in 2017. Now, it is up to you to see who deserves the crown. As mentioned above, 2017 was a busy year for Strange and setting the tone for the year was the February release of Catastrophic Event Specialists from Strange Music's lone duo, Ces Cru. The expertly assembled album contained sharp commentary on the current musical and political climate, without becoming redundant or lacking raw energy. They even threw in a set of music videos that, played in either order, created a cohesive loop! In addition to the album, the duo also threw a release party for the ages at an arcade bar in KC, got a shoutout from The Rock, and had the crowd chanting their name at the Fillmore in Denver. Hip-hop is rooted in storytelling. So, in that sense, MURS' Captian California album, which tells 13 different stories from 13 different perspectives, might just be the most hip-hop album released this year. MURS covers subjects from gentrification to gang violence to competing with a friend for the affection of a lady, with color, passion, and the ease of a seasoned veteran. Getting in an entry under the wire, last week, MURS also released a video for "Melancholy" which is attached to a project that will put him in the running for the 2018 MVP as well. Oh, and all the while, he's been busy hosting hiphopdx.com's DX breakdowns. To say Wrekonize was busy in 2017 would be an understatement. In May, Wrek released Into The Further, his second solo album since signing to Strange. Where most artist would call it a day year at one album, Wrek was a part of the two collabos albums, appeared on JL's DIBKIS album, and, of course, repped the ¡MAYDAY! crew to the fullest on Search Party, all while being on the road as a part of two ¡MAYDAY! tours. That kind of work ethic, without ever, sacrificing quality, is an impossible feat, but Wrekonzie achieved it, making him more than worthy of the 2017 MVP crown. Every Strange fan knows how important the live show is to the DNA of the Snake & Bat and nobody exemplified that more than Stevie Stone. This year he was a part of The Strictly Strange Tour, The Strange Reign tour, and several solo runs, each time bringing the energy to another level. Oh yeah, speaking of levels, he also released his Level Up album this year, an album which beautifully combined his gritty rap with his amazing, soulful singing to create one of the most uniquely flavored albums of the year. From his live show to his recordings, Stevie really did live out his album title and leveled up his entire game. In 2017, JL announced his arrival with the release of his debut album DIBKIS. An acronym for "do it big, keep it Strange." More than just a title, it's a mantra that perfectly represents JL's 2017. He did it big an album that delivered banger after banger, and kept it Strange, releasing a new Strange anthem, contributing to the two collabos projects, ¡MAYDAY! 's Search Party, and laying down a stellar verse on Stevie Stone's "Eat II." Under the pressure of showing he is worthy of the Snake & Bat chain, JL delivered time and time again. A breakout year if ever there was one. For those watching JL in 2017, congratulations, you just witnessed the start of a Strange superstar. ¡MAYDAY¡ could have spent the year kicking back and playing WWE2k18 while listening to "Last One Standing" (which The Rock hand-picked for the video game's soundtrack) but instead they hit the road twice, once with Common Kings and once on their own. Despite being road (and video game) warriors, the ¡MAYDAY! crew also found time to create what is arguably their most mature, well-constructed album to date in Search Party. Their achievements are all the more impressive when you consider how much change they have gone through and adversity they have faced (a topic of conversation on the album), making them tough competition for the 2017 MVP title. Though it was released in just late Septemeber, Rittz' Last Call album has already put up some serious numbers. It reached number 2 on the iTunes hip-hop chart, and the "I'm Only Human" video is the most popular Strange video of 2017 with over 4 Million views in a matter of months. The reception of the album is a testament to Rittz biggest endeavor yet which hosts live instruments, huge choruses, and thoughtful emotional lyrics delivered with passion and precision. Last Call is Rittz best work yet. It's clear the fans agree. He even took the album on the road with the Last Call tour, capping off the MVP caliber year for Strange's Southern spitter. Above Waves hit the ground running this year starting things off with their first release ever in "Fugitives," a slow, simmering effort that showcased lead singer Ryan Bradleys’ powerful vocals. Following the black-and-white themed effort, Above Waves showcased their versatility with “Simple Things,” which hosted one of the more colorful, grand-scale videos of Strange Music’s 2017. After months on the road, sharing their story with radio DJ’s across the country and playing shows (like 95.7 The Vibe's Elfmas or the Strange Reign release concert at Red Rocks), the group ended the year with arguably their strongest release in the intoxicating, vibrant, “Chasing The Moment.” Oh and let’s not forget their Strange reign collaboration with Tech N9ne, "Dangerous," because, how many pop acts could pull off a song with a rapper and still stay true to their roots?! Showcasing their range, releasing two videos, all while on the road, Above Waves we're on their MVP caliber grind this year! Darrein was signed as an R&B singer to help push Strange in different directions and to new heights. With "Lover Friend" and songs like "Put Em On," that fresh sound, combined with his knack for knocking a hook out of the park was on full display in 2017. But what really defined Darrein's MVP-worthy year is how he turned heads by showcasing his razor sharp flow. On "Get Off Me," which got video treatment in 2017, Darrein lays down the glossy hook, but before he does, he squeezes in a few bars with a flow that seems to avalanche picking up steam with each bar. It was the first but it wouldn't be the last. All year he flexed all over the collabos series with entries like on "Reloaded"-where he hits the double-time but makes it sound so effortless, matching the sinister, yet airy vibe of the beat- and he stood tall next to Scooba and Tech on "Let Go." And let's not forget his Sway in the Morning appearance, where demonstrates some on-the-fly bars; a true test of any emcee.